I love a good pizza. And this is certainly my go-to spot for one. From the outside, you’d be forgiven for thinking you were in the wrong place, in an industrial estate in Tottenham. And it certainly doesn’t look like a restaurant. A discrete sign outside a closed door just about gives it away, though you have to ring a bell to get in. 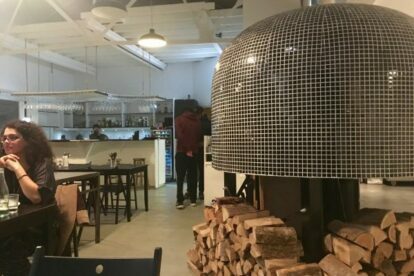 Once inside, the smells lead you upstairs to the first floor where the restaurant reveals itself with a large, tiled pizza oven. Trust me when I say the effort to find this place is worth it. The pizzas are Neapolitan-style and cooked to perfection, and come with a selection with both traditional and more experimental toppings made with good quality Italian ingredients. My favourites are the N’duja (spicy soft sausage) or Burrata (topped with creamy cheese and rocket). The desserts, such as the Cannoli, also come highly recommended.